Could you tell us about molecular cuisine? “Molecular cuisine” is, first and foremost, a flawed expression, which leads to great confusion, as it is no more “molecular” than any other type of cuisine. 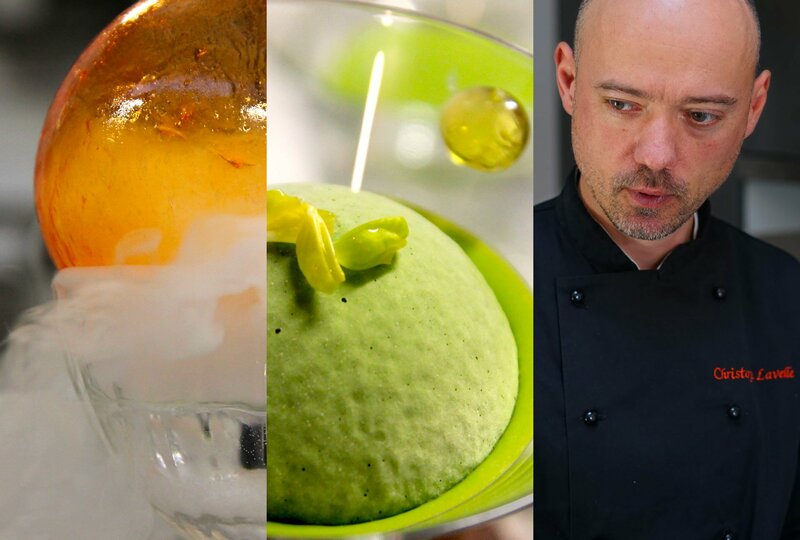 Let’s be quite clear: in the beginning, molecular gastronomy was created as a “scientific discipline devoted to the study of the phenomena that occur during food transformation and consumption” (according to the definition of one of its co-inventors, Hervé This). Incidentally, gastronomy, having itself been defined two centuries earlier by Jean-Anthelme Brillat-Savarin as “the knowledge and understanding of all that relates to mankind as he eats”, it is without doubt just as pertinent (and historically correct) to paraphrase Brillat-Savarin to provide another definition of molecular gastronomy. This would be “the knowledge and understanding, on a molecular scale, of all that relates to mankind as he eats”. Concerning molecular cuisine, which could be identified as a slightly futuristic cuisine practised by a certain number of celebrity Chefs at the end of the 90’s, the question is a little more sensitive. This is due to the fact that it doesn’t really have just one inventor, and all the Chefs who played a role in its popularity try, and rightly so, to shed the molecular label and replace it with more flowery language such as techno-emotional cuisine, culinary deconstruction, avant-garde cuisine, etc. What is your relationship with this discipline? I have cooked for just as long as I have been involved in science, which is to say from a very early age. At the end of the 90’s, when I was writing my thesis (on molecular biophysics, in a field that had nothing to do with cuisine), this quite naturally led me to have a keen interest in molecular gastronomy, and more generally speaking in everything that had a link, whether close or not, to food (culinary techniques, physiology of taste, food anthropology, etc.). This later led me to create a number of university programmes on science and cuisine, in different sectors (science, management, professional education, etc.) and universities (Paris 6, Toulouse, Lyon, Cergy-Pontoise, Marne-la-Vallée, Marseille, etc.). How did you decide that you wanted to work on the relationship between Culinary Art and science? When you have an equal interest in both science and cuisine, diving headfirst into molecular gastronomy comes quite naturally! It is also true that my scientific background, which mainly focuses on understanding our cell structure and gene expression, touches on physics, chemistry and biology, which constitutes the ad hoc fundamentals for trying to understand what happens in cuisine. There is also, of course, the human element, and meeting Hervé This, more than 15 years ago, was without doubt the catalyst that led me to dedicate myself to this discipline. It is important to be aware that scientists are driven by a unique syndrome, which pushes us to try to understand everything (even if, in reality, we know that we must accept that we cannot find the answer to everything!). Therefore, I cannot stop myself from thinking about the origin of ingredients when I buy them, of the reactions involved when I cook them and what these foods will become and the possible effects on my metabolism and my health when I eat them. Obviously, stating things in such a way can give the impression of taking all the pleasure out of cuisine. This, however, is not the case, on the contrary! I promise you that imagining how a tomato grows on its stem, how egg white protein stretches when whisked, or how the triglycerides in cocoa butter crystallize when tempering chocolate, takes nothing away from the beauty of cuisine ! As far as molecular cuisine is concerned, I must say that it interests me in exactly the same way as any other type of cuisine. In other words, I am just as keen to learn how to make (but also to understand the process behind it) balsamic vinegar caviar as béarnaise sauce or Grand Marnier® soufflé. What do you see as being the future of this type of cuisine? As with everything that is fashionable, molecular cuisine will almost certainly disappear and be replaced by the latest trend! However, as is always the case, it will leave its mark, with techniques (such as spherification) and tools (such as the siphon), which have, today, become classics. In other words, we can consider that molecular cuisine is dead as it has, in part, become diluted into the general mass and has made its contribution to the evolution of cuisine. The same can be said for nouvelle cuisine, a trend advocated by Gault et Millau in the 70s, which corresponds to what we now consider to be normal cuisine, because the evolution it brought about at that time has now become part of our way of life. In other words, long live mushroom espumas and ginger caviar … home-made of course! Can anybody do this kind of cooking? Excluding “cryocooking”, which mainly revolves around the use of dry ice or liquid nitrogen, which are potentially dangerous for the person handling them, molecular cuisine is, of course, achievable by anybody, as it is after all just cooking. A little curiosity and good technical skills are necessary, but this is the case for any type of cuisine! Molecular gastronomy, on the other hand, is clearly a scientific domain and requires long and specific training. Do any training programmes exist to be able to work in this profession? How can you work in molecular cuisine? There is not really a specific training programme as there isn’t really a specific profession! A molecular cuisine professional is, above all, a cuisine professional! 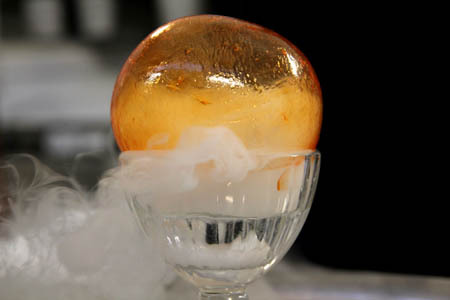 In less than an hour, I can teach any Chef how to make a sorbet with liquid nitrogen or spherification using alginate. In short, if you know how to cook, in less than a day we can cover molecular techniques and the matter is closed. It then takes a lot longer to adopt the techniques: knowing how to use gelling agents is simple, doing something of interest with them in your cooking is another story. Be aware, however, that here I am focusing exclusively on the practical side. Understanding how the techniques work takes much more time and training programmes do exist, especially for teachers. I, myself, am in charge at the ESPE (École Supérieure du Professorat et de l'Éducation) of the scientific training of future cuisine teachers, which includes the fundamentals of molecular gastronomy (main components of foods, reactions that take place in the transformation of ingredients, physiology of taste, nutritional and environmental aspects of diet), but also mastering so-called molecular techniques (working with a siphon, liquid nitrogen, cooking at low temperatures, use of vegetable-based thickening agents, etc.). What type of client do you work for? I’m an academic, so I mainly work for the state, whether as part of research projects (my activities being principally funded by the CNRS, the INSERM and the COMUE Sorbonne Universities) or in the field of communication initiatives and training (for schools, universities, the general public, the professional restaurant field, teachers). I also, of course, have discussions/cook (I almost daren’t say work) with Chefs, but in a completely informal and convivial manner! Do you know professionals in this field? Places to try molecular cuisine? There are very few restaurants in France that could be described as being molecular. In Paris, Thierry Marx is without doubt the one who receives the most media attention. Outside of Paris, you would need to go to Futuroscope (Le Cristal restaurant, in the centre of the park), where Noël Gutrin, one of the precursors in the field, has developed a menu which, for more than 20 years, has showcased the very best molecular techniques. In order to learn more about beerologist, we went to meet Hervé Marziou, who has been a beerologist for the past 16 years, to ask him a few questions.